Do you often find yourself looking for a program in the long list of the Start menu? We suggest you install Handy Start Menu. This small utility makes computing much easier - it's easier to find and launch programs. Why Install Handy Start Menu? Use Handy Start Menu to start applications much more quickly. Just click on a folder with the name of an application, and Handy Start Menu will do the rest. You will no longer have to create piles of shortcuts on your desktop to run applications. Access to all programs from the Start menu becomes so easy and convenient that you will need the desktop only for beautiful wallpapers. The days of massive lists in your Start menu are gone. Now you can have short and handy lists of programs. Thanks to Handy Start Menu, you can automatically group and reduce useless items. 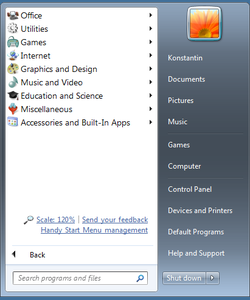 Your standard Start menu will become shorter and simpler.